Prof. Arvind Kumar, a renowned educationist and researcher has been appointed as the first Vice Chancellor of RLBCAU, Jhansi. Born on July 4, 1952 in Haridwar ,Prof. Kumar has an excellent academic record to his credit. He obtained M. Phil. (1971) and Ph. D. in Agronomy (1975) from Meerut University, Meerut, UP, India. 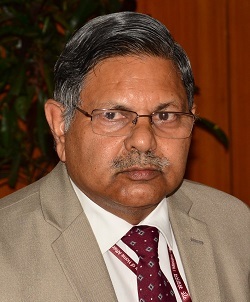 Prior to this assignment Prof. Kumar worked as Deputy Director General (Education), ICAR, New Delhi from 2009–2014, held the additinal charge of Deputy Director General (Fisheries), ICAR, New Delhi about 5 months and was the Director of Directorate of Rapeseed-Mustard Research (DRMR), Bharatpur from 2002 to 2009. Under his dynamic leadership, Education Division, ICAR took several initiatives and made policies for improvement of agriculture education in India. DRMR flourished during his period and development of first mori CMS based hybrid NRCHB 506 in India took place. He also contributed towards the development of 4 high yielding rapeseed-mustard varieties namely NRCDR-2, NRCHB-101, NRCDR-601, NRCYS, 5-2. Recipient of the ISA Gold Medal and life time achievement award, Dr. Kumar has been recognized for his professional achievements by several awards and fellowships. He has been awarded with Dr. Rajendra Prasad Purushkar (1991-93) by ICAR for the book on Crop Geography of India (In Hindi), Fellow of the Indian Society of Agronomy (1996), Fellow of Indian Society of Oilseed Research, Fellow of Society of Extension Education (2009) and Fellow of National Academy of Agricultural Sciences (2012). President of Indian Society of Agronomy (2011 & 2012) and the Society of Rapeseed Mustard Research since its inception (2008). Dr. Kumar received the Life time Achievement Award for his significant contributions in Agronomy & Rapeseed Mustard by ISA and SRMR. He is member of the board of management of several national repute institutions like IARI, GBPUA&T ,CAU, Imphal and SKUAS&T,Jammu. For his outstanding contributions to the field of Rapeseed-Mustard research, he was awarded “Membership” by International Consultative Group for Research on Rapeseed, Paris (France), which is the International recognition given to Dr. Kumar for outstanding contributions in rapeseed-mustard research in India. During his professional career at GBPUA&T, Patntnagar for about 27 years ,has involved in teaching, research and extension education and also assigned various responsibilities including Joint Director extension. He has published more than 150 research paper in Indian and foreign journal, 85 popular articles, 56 books/ booklets/ chapters and presented more than 195 papers in National and International Conferences on aspects of oilseed research and management. He has vast National and International experience and visited 24 countries for Professional reasons.